The staff here will be on retreat the rest of this week. But before we left, we wanted to remind you to check out the newest issue of the magazine. The Autumn issue of ONE is now online. The print edition should be arriving in your mailbox any day now. For a preview, check out the brief video below from Msgr. Kozar. And then visit us at this link for more. See you next week! 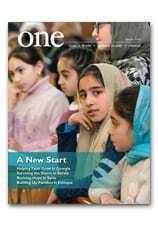 Photojournalist Molly Corso lives and works in Tbilisi, Georgia, and wrote about one community of Georgians in the Autumn edition of ONE. Here, she offers some personal insight into what it was like covering the story. In my very blessed life as a foreign correspondent based in Georgia, I travel to a lot of villages. Georgian villages, Armenian villages, Azeri villages. Villages high in the mountains, villages built too low to survive flooding. I see villages that were once prosperous and villages that have been abandoned. But, regardless of where I am traveling there is one constant: villages in Georgia are heart stopping, spirit crushingly poor. So, heading out to two Catholic Armenian villages in the southern region of Samtskhe Javakheti very early one morning in August, I had two expectations: the villages would be poor and the roads would be bad. I was not, however, prepared for the beauty of the region or the breathtaking generosity of the locals. The road, once we turned off the main highway that connects the region with the capital (and the rest of the country), was little more than a stony country path. It was so bad, in fact, that some smart local had created an alternative route off to the side because driving through the field was smoother than trying to circumvent the potholes on the road. Driving aside, the countryside was intensely beautiful, a scrub hard valley tucked in between sloping rock hills. There were neat stone farmhouses – very different from traditional Georgian homes – lining golden fields. The pungent odor of farm life was everywhere, following us as we skirted a pretty stream and crossed old stone bridges. Once we turned off the main highway, very few people spoke Georgian although most – but not all – spoke Russian, so we could communicate even without known Armenian. But communication was not always easy, all parties trying to speak through an obviously foreign tongue. That was especially true of our first encounter with the locals. We pulled up beside a group of two men and a woman with a child to ask directions. The men spoke a smattering of Russian, enough to tell us we were on the right path to the village – and to ask us to take the woman and child with us. They clamored into the car and away we went. Very soon, however, it became clear they only spoke Armenian. “Some bread” ended up being an entire meal and the experience was repeated at nearly every home we visited the entire day. One of the poorest families we visited, two pensioners left to live out their old age alone in a crumbling farmhouse, wouldn’t let us leave without taking some homemade cheese (delicious!) and were deeply offended we would not stay for some homemade brandy. Generosity is an important trait in the Caucasus — a part of the regional culture and a source of pride. But never, in a decade of living and traveling in Georgia, have I met people as gracious and rich of spirit as the Armenian Catholics in these villages. At our last stop, at a house in Ujmana, we asked one gentleman where this fountain of generosity comes from and he answered with a shrug, "It has always been like that here. Samtskhe Javakheti is a very kind place." You can read more on Armenian Catholics in Staying Power in the Autumn edition of ONE. A Syrian refugee boy flashes a peace sign along the border in Kilis, Turkey, in mid-September. More than a 1 million Syrian refugees are under 18, about 740,000 under 11, according to the U.N. High Commissioner for Refugees. Read more about the refugees in this story from the Catholic Register. And visit our Syria giving page to learn how you can help. In this image from 2012, Melkite Patriarch Gregory III attends Mass with Pope Benedict XVI on the waterfront in Beirut. At left is Cardinal Tarcisio Bertone, former Vatican secretary of state.